Not everyone has a beast PC which could run CS:GO butter smooth constant at 300 FPS. Or perhaps you could be the one having a beast but not getting enough FPS. Or you are probably facing a lot of connection issues with error messages “Warning! Connection Problem. Auto-disconnecting in X seconds”. Tutorial / guide on how to fix CS:GO FPS drops / lag / stuttering or you may rephrase it as CS:GO optimization guide 2017! Remember: This guide is focusing on the best performance as well as the lowest input lag, not how the game looks. One thing that can increase your FPS significantly is to update your GPU drivers. If you build your computer you most likely know what GPU you have since you picked all the parts. But a lot of people buy their computers pre-built and may not know what GPU model they have. There is an easy way to find out what GPU model you have. Go to windows “Search” and search for “dxdiag”. A window will pop up, press “No” and then go to the “Display” tab where you will find the GPU model name. For Nvidia users you can also update your graphics driver via Nvidia GeForce Experience and for the AMD users you can update via AMD’s Radeon ReLive. Always make sure you have the latest driver installed. Power options: Go to windows search and type “Power Options”. In here you want to select the “High Performance” plan. This might give you a slight FPS boost and smoother multi-tasking and Alt-tabbing. This is highly essential for laptop gamers. Disable Xbox Game DVR: Unlike most Windows 10 features, which can be configured in the Settings app, the Game DVR and Game Bar features are buried in the Xbox app. Launch the Xbox app from your Start menu. You’ll need sign in with a Microsoft account if you haven’t already. Once you’re signed into the Xbox app, click the gear-shaped Settings button at the bottom-left corner of the app and then click “Game DVR”. Disable the “Record game clips and take screenshots using Game DVR” option at the top of the screen. This will disable background recording, the Game Bar, and other Game DVR features. Game DVR, including background recording and the Game Bar, will now remain disabled unless you return to the Xbox app and enable it. Advanced video settings: Set everything to lowest except Global Shadow Quality because it gives you competitive advantage when you can visually see the shadows of your opponents clearly without much compromise in FPS. Make sure you enable Multi-core rendering because this allows CS:GO to render in all the cores of your CPU. Display options: Lower the resolution, more the FPS. If you play at 4:3 800x600px resolution, you’ll get the maximum possible FPS. But do remember that you also have to give up on good visuals and witness pixelated textures, player models everywhere. 16:9 and 16:10 is nowadays more preferred because of it’s higher field of view. Most of the pros use 4:3 because they have been playing in that aspect ratio for years – since Counter Strike 1.6 era! Audio options: Go to options and then “Audio settings”. Turn off all music options so that you can hear what is happening in-game; the footsteps, bomb plant, gun switches, grenade throws etc. Also make sure to change Speaker Configuration option to “Headphones” from HRTF as it will give you some FPS boost too. HRTF is a new feature implemented by Valve in CS:GO and is expected to give you a competitive edge by allowing you to hear from 360° directions throughout the map. Launch Options: We want our launch options to be clean and simple not 100 different commands. Too much stuff in your launch options will mess up your game with lower fps, input lag, mouse lag etc. We only need the most important commands. Go to your steam library and right click on CSGO. Click on “Properties” and then “Set launch options”. “-freq 144” or “-refresh 144” Monitor refresh rate. Use the highest your monitor supports. “-tickrate 128” Makes offline servers 128 tick. Can be useful if you want to train your aim vs bots with 128 tick. “-nod3d9ex” Makes alt tab faster. “+mat_queue_mode 2” Multi-threaded mode. For some people this can give a massive increase in fps and for some it can even lower their fps. “-threads X” where X is your amount of threads. Not your cores. Don’t use this anymore, it got patched a while ago. It can lower your fps if you use it. “-high” Makes the game run in high priority. Don’t use this anymore. Even though it can give a slight fps increase, it will mess up your system more than it will help. Buy a Solid State Drive (SSD) and install CS:GO in it. CS:GO will launch faster, maps will load faster and you will definitely be the first one to connect in the server unless the other players too have SSD installed. Always keep your graphic drivers updated, especially if your drivers are very old. Make sure to scan your PC regularly for viruses and clean bloatwares, temporary files and junk regularly. Use softwares like CCleaner to clean them. Make sure to defrag your hard disk drives regularly. Do NOT defrag your SSD. 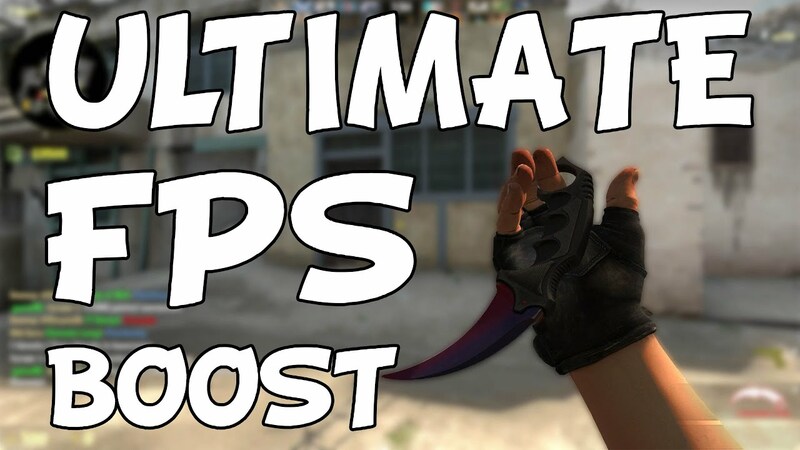 If you are still not getting FPS boost watch out this video to boost your FPS in CS:GO, it might help you out. We will be updating this guide regularly, so keep checking this out. If you have any suggestions or if you feel we have forgotten any important tweak do make sure to drop down below in comments. We’ll soon be adding config file optimizations, Nvidia control panel settings and even more tweaks to help you get more FPS, reduce lag and stuttering in CS:GO 2017! ← SkinsMarket – The easiest way to sell skins!